Prior studies have confirmed what is known by many of those who work in EMS: a high proportion of patients that are transported have non-emergent conditions. Several studies have demonstrated that between 33 and 50% of all ambulance transports are for non-emergent causes. These transports often times result in signifiant resource utilization from EMS systems that are stretched very thin. Furthermore, these transports may often be linked with ED overcrowding problems and increased healthcare costs. The role of telehealth has already been shown to be a cost effective and beneficial approach to many aspects of healthcare, including tele-ICUs and within EMS as part of trauma, stroke and cardiovascular care. The primary objective of this study was to investigate the impact of a large-scale telehealth program that utilizes non-ambulance based transportation (i.e. taxi) and paramedic triage of non-urgent complaints on overall EMS transports. ability to be transported in a passenger vehicle. Patients who did not meet all inclusion criteria or who had other high risk features of their presentation suggestive of an emergency condition were excluded from the analysis. For those who qualified for the study, enrollees were connected via tablet to a board certified emergency physician who determined if the patient could be referred for follow-up with a primary care facility via versus requiring transport via ambulance. 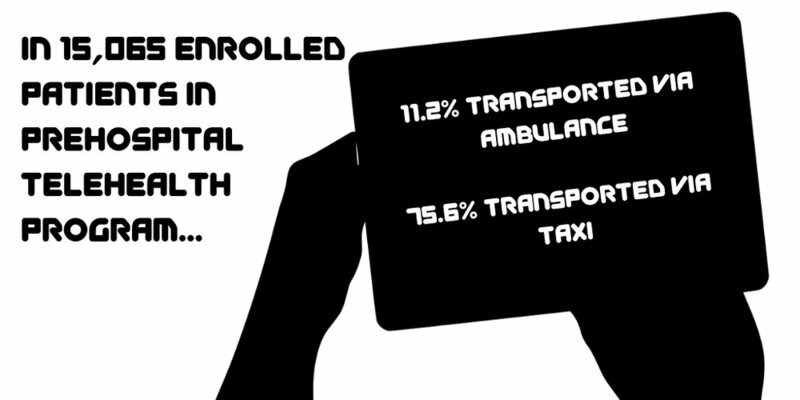 The primary variable that was studied was whether patients were transported by ambulance. Patients who were not transported via ambulance were offered transport to the ED or a primary care facility via taxi. EMS agencies are faced with increased demand of services by the public with decreased available resources and higher costs. Telehealth in the prehospital setting is a novel approach to identify patients that may be suitable for transport via taxi and allow for EMS units to stay in service and serve other patients who present with other time critical conditions. This study did not show a significant decrease in the number of patients that were ultimately transported to the ED (only 2% of overall call volume participated & the majority of patients were still transported to the ED via taxi) and did not provide patient outcome data regarding accuracy of triage as non-emergent. However, it does demonstrate that a telehealth program is feasible within a large EMS system and highlights a promising avenue towards matching healthcare resources with patient needs and thus represents an important advancement in the field of EMS medicine. Suicide is a public health crisis with an estimate 45,000 individuals dying from suicide annually. Certain professions, including law enforcement and EMS are exposed to high degrees of workplace stress, therefore it is hypothesized that these individuals are more predisposed to conditions including anxiety, depression and suicidal ideation and behaviors. Survey data examined by the National Association of Emergency Medical Technicians (NAEMT) has indicated that there is very high occurrence of suicidal ideation within the EMS community. Despite this important information, the relationship between suicidal ideation and suicide attempt with the completion of suicide in EMS providers has not been well studied. The authors of this study aimed to assess the odds of death by suicide completion in EMTs compared to non-EMTs. The investigators conducted a retrospective case-control study that analyzed the electronic death registry in Arizona from January 2009 to December 2015. Only adults greater than or equal to the age of 18 were included in the analysis. Multiple variables from the death registry were examined including age gender, race, ethnicity, and most importantly for the purposes of this study: cause of death and occupation. With respect to occupation, the term "EMT" was categorized as all individuals who had EMT certification, including firefighters, EMTs and paramedics. A logistic regression model was implemented to calculate the mortality odds ratio (MOR) of suicide between EMTs (exposed group) and non-EMTs (non-exposed group). o 63 (5.2%) were attributed to suicide. This is compared to the non-EMT group of which 2.2% of deaths were due to suicide. · The most common mechanisms of suicide in the EMT group was firearm (67%), however there was no significant difference between death by firearm in the EMT cohort versus the non-EMT cohort. · In the Arizona electronic death registry, there were higher odds for death by suicide in EMTs compared to the general public. EMS providers are faced with significant workplace stressors. Whether it’s traumatic calls, poor sleep quality, poor compensation, long hours, or overall low job satisfaction, EMS remains one of the most challenging professions. These aspects of the EMS profession, unfortunately, contribute to a host of mental health issues including depression, anxiety, PTSD, all of which predispose individuals to developing suicidal ideation and behaviors. The time to act is now. The results of this study are extremely compelling and must serve as the impetus for change within the profession. Further studies that precisely characterize the risk factors that place EMS providers at higher risk than the general public should be examined as well. Despite this, the findings from this research still demonstrate the need for greater EMS education regarding the symptoms and warning signs of suicidal behavior, the importance of adequate resources for counseling and mental health, and improved work conditions to protect those individuals who protect our communities and our patients. Article Reviewed by Article Bites Editor Al Lulla, MD. Other than early CPR and defibrillation, there are few measures that have been shown to improve outcomes for out-of-hospital cardiac arrest (OHCA). Despite this, epinephrine has been at the crux of ACLS management of patients with OHCA given the thought that it can cause peripheral vasoconstriction, increased beta adrenergic activity and augment coronary blood flow. In turn, epinephrine increase chances of return of spontaneous circulation (ROSC). While higher rates of ROSC have been confirmed in prior studies on epinephrine, unfortunately most of what we know about epinephrine suggests that it’s administration may not improve the most important clinical outcome - neurologically intact survival. The PARAMEDIC2 trial (Prehospital Assessment of the Role of Adrenaline: Measuring the Effectiveness of Drug Administration in Cardiac Arrest) was performed to assess whether epinephrine was beneficial or harmful as demonstrated by the primary outcome of 30 day survival. The investigators conducted a multi agency (5 ambulance services), randomized, double-blind, placebo controlled trial in the United Kingdom from December 2014 to October 2017 in adult patients who sustained OHCA for which ACLS was provided by paramedics. Patients were excluded from the trial if they were pregnant, less than 16 years of age, had cardiac arrest secondary to anaphylaxis or asthma, or if they had administration of epinephrine prior to the arrival of EMS personnel. If initial resuscitation measures (CPR and defibrillation) were unsuccessful, patients were randomized to the intervention arm (1mg epinephrine q3-5 mins in accordance with ACLS protocols) or the control arm (normal saline placebo). As stated above, the primary outcome of the trial was 30 day survival. Secondary outcomes that were examined included rate of survival until hospital admission, length of hospital stay and ICU stay, rates of survival at hospital discharge and at 3 months, neurological outcomes at hospital discharge and at 3 months. Favorable neurological outcome was defined as modified Ranking score of 3 or less. 30 day survival: 3.2% in epinephrine group vs 2.4% in placebo group (OR 1.39; 95% CI 1.06-1.82, p=0.02). Favorable neurological survival at 3 months (modified Rankin score 3 or less): 2.1% in epinephrine group vs. 1.6% in placebo group (OR 1.31; 95% CI 0.94-1.82. 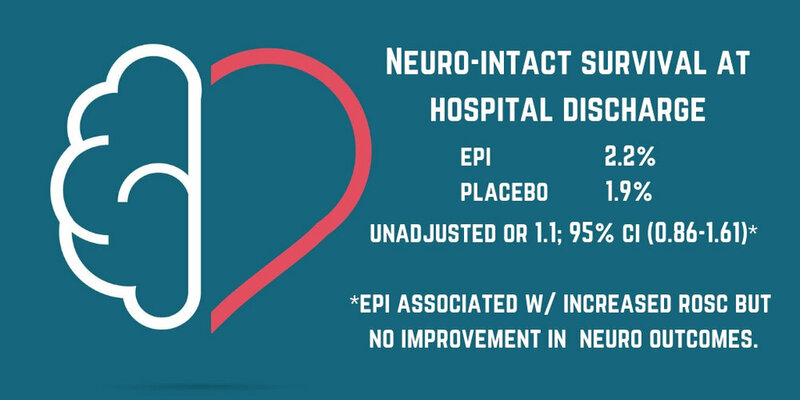 Takeaways:In this multi-agency, prospective, double blinded randomized placebo controlled trial, administration of epinephrine for OHCA was associated with a statistically significant higher 30 day rate of survival compared to placebo, but no difference in neurologically-intact survival. What this means for EMS:This study is the largest randomized controlled trial performed to date studying the impact of epinephrine administration on survival and neurological outcomes for OHCA. While administration of epinephrine has long been the pharmacological mainstay of prehospital (as well as in-hospital) management of OHCA, this trial calls into question its influence on patient centered outcomes (i.e. neurological intact survival). While this paper will surely be at the center of debate in the upcoming years within EMS circles around the world, one thing remains abundantly clear at this point: good quality BLS Care in the form high quality CPR and early defibrillation have the greatest impact on neurologically intact survival and should be the primary focus of resuscitation for cardiac arrest. Article Bites #7: Should Air Medical Transport administer plasma to trauma patients at risk for hemorrhagic shock? Hemorrhagic shock remains the most significant cause of mortality in trauma patients. In particular, coagulopathy is a significant contributor to death in this patient population and has been a focus of what is termed “damage-control resuscitation” in both civilian and battlefield arenas. Currently, there is a stronger push for resuscitation with blood-components including platelets and packed red cells in favor over crystalloid based resuscitation strategies. The premise of early damage control resuscitation in the pre-hospital environment is predicated on intervening at the point of injury and mitigating downstream complications including coagulopathy and irreversible hemorrhagic shock. Plasma administration as part of damage control resuscitation is thought directly address coagulopathy and improve chances for survival. This trial, termed the “Prehospital Air Medical Plasma (PAMPer)” trial sought to investigate the efficacy and safety of prehospital plasma administration in severely injured trauma patients. The primary outcome was the impact of prehospital plasma administration on 30 day mortality. The investigators conducted a phase 3 multi-center cluster-randomized trial involving trauma patients (blunt or penetrating) who were deemed to be at risk for hemorrhagic shock during air medical transport. Individual air medical bases were randomized to give plasma vs standard resuscitation in 1 month blocks. The intervention arm included patients who received 2 units of universal donor thawed plasma. The comparison group received standard of care resuscitation (crystalloid based resuscitation). Patients were deemed to be “at risk” for hemorrhagic shock were enrolled in the trial if they had at least one episode of hypotension (defined as systolic BP <90 mm Hg) and tachycardia (defined as HR >108 BPM) or if they had severe hypotension (defined as SBP <70 mm Hg) at any point in the prehospital phase of care. There were several exclusion criteria some of which included patients older than age 90 or younger than age 18, individuals who were pregnant, had traumatic cardiac arrest lasting longer than 5 minutes, penetrating brain injury, or refusal by family member to participate in the trial or if the patient was wearing an “opt-out” bracelet reflecting their wish not to participate in the trial, among others. Absolute reduction was 9.8% in the plasma group (95% CI 1.0 to 18.6%; P=0.03). Number needed to treat (NNT) was 10. In this prospective trial administration of plasma in the prehospital aeromedical transport setting was associated with decreased 30 day mortality in trauma patients at risk for hemorrhagic shock. In 2015, the PROPPR trial demonstrated improved outcomes in trauma patients receiving blood products (packed red cells, platelets, plasma) compared to crystalloid resuscitation. Little research has been done on the role of plasma administration at the point of injury in the prehospital setting. This study was one of the first to show that rapid prehospital administration of plasma products is associated with improved 30 day mortality. As stated in Article Bite #4, transfusion of blood products in the prehospital setting is associated with many logistical roadblocks, including but not limited to refrigeration, coordination with blood banks, and issues pertaining to wastage of products with a short shelf life, are all important considerations prior to routine implementation of this intervention. Given the traditional model of prehospital trauma care has focused on rapid transfer to a trauma center for definitive management, prehospital administration of plasma is a potential intervention that may lead to improved patient outcomes in some systems where distance to trauma center leads to extended prehospital times*. * The COMBAT trial, which evaluated prehospital plasma transfusion for patients with signs of hemorrhagic shock within an urban system, did not find similar benefit. Alter, S. M., Haim, E. D., Sullivan, A. H., & Clayton, L. M. (2018). Intubation of prehospital patients with curved laryngoscope blade is more successful than with straight blade. The American journal of emergency medicine. There are two direct laryngoscope blades available to EMS: the curved Macintosh and the straight Miller. Most providers learn to operate both blades, but tend to gravitate towards one based on personal and/or institutional preference. Existing literature suggests the straight blade allows for better visualization, but perhaps intubation is easier with a curved blade. However, there are no existing studies comparing these blades in the prehospital setting. The aim of this study is to compare intubation success with a Macintosh blade versus a Miller blade as performed during pre-hospital endotracheal intubation (ETI) by paramedics. Methods: This was a retrospective chart review of patients who underwent prehospital ETI from 2007 – 2016 by a single hospital-based suburban EMS service in/near Boca Raton, FL. This system had a 20K EMS volume, double ALS ambulances, 2-tiered system. Intubation attempt was defined as blade passing incisors. Intubation success was defined as confirmation of oxygenation & ventilation following ETI. Conclusions: Both first pass success rates and overall intubation success rates for paramedics were significantly higher when Mac blades were used. In this retrospective study, first pass success rates and overall intubation success rates for paramedics were higher when Macintosh blades were used. The difference of 13-15% is expected to be clinically significant. Other process measures such as perintubation hypoxia were not measured. The results of this study demonstrate correlation, not necessarily causation and are subject to confounding variables. For example, the training backgrounds, in particular experience with different blade times, are unknown. However, this is a thought provoking study from the education and training perspective. Should we be stressing training with curved blades or should we focus efforts to improve training with Miller blades or versatility in psychomotor skills? Article Bites #5: Pediatric Intubation - What's the first pass success rate in a physician-staffed helicopter retrieval service? Analysis of Out-of-Hospital Pediatric Intubation by an Australian Helicopter Emergency Medical Service. Adequate establishment and maintenance of a patent airway is one of the hallmarks of resuscitation. Pediatric intubation poses particular challenges, most notably lack of provider experience. It is estimated that first-pass success ranges from 66% to 85%. Prior studies have demonstrated no significant improvement in pediatric outcomes with prehospital intubation. The intubation success rate in this study was only 57%. Despite the difficulties associated with pediatric intubation, it remains within the scope of practice in the prehospital setting in some EMS services. The primary goal of this study was to report first-look success rate in pediatric advanced airway management in a physician-led adult out-of-hospital helicopter retrieval service. The secondary goal was to evaluate for potential complications of airway management as well as success by operator type, patient age and type of intubation. The investigators conducted a retrospective study evaluating patients who were treated by the Greater Sydney Area Helicopter Emergency Medical Service in Australia. This helicopter EMS service (HEMS) is comprised of a 2-person medical team with a physician and a paramedic. Physicians were usually board certified in emergency medicine or anesthesiology or residents with at least 5 years of experience. Paramedics were critical care paramedics with 10 years of experience and additional training with out of hospital care and retrieval medicine. The investigators evaluated an analysis of all out of hospital and interhospital pediatric intubations between January 2010 and April 2015. The only inclusion criteria was that the patient be younger than 16 years of age. Patients were intubated at the discretion of the team, with rapid sequence intubation (RSI) versus cold intubation (most frequently for cardiac arrest). The measures that were reported included critical timings (i.e. time to intubation), demographics, provider background, number of intubation attempts and complications. First look success rate: 91% (75/82; 95% CI 83 to 97%). The overall success rate was 100%. The most common indications for intubation included trauma (83%), head injury (56%), combative/agitated patient (29%). In this retrospective series of pediatric intubations in the prehospital setting by a physician-lead helicopter service, first pass success was 91%. Overall success rate was 100% with only 9% of patients requiring multiple attempts). The role of intubation in the field for pediatric patients is extremely controversial. Prior studies have demonstrated low rates of first pass success and overall lack of significant improvement in patient outcomes. This study showed an uncharacteristically high rate of first past success in the prehospital setting for pediatric patients. The investigators of this study attribute their high rate of success to a rigorous training program for providers in the field, frequent practice and checklists amongst other mandated practices. Overall, pediatric intubation in the field is a relatively rare occurrence with limited “on-the-job” training experience, which may be what has historically contributed to its unsuccessful implementation in the field. This study highlights the importance of adequate training and psychomotor mastery to performance of critical skills, particularly those that are rarely performed. It did not evaluate the effect on clinical outcomes. 1. Gausche, M., Lewis, R. J., Stratton, S. J., Haynes, B. E., Gunter, C. S., Goodrich, S. M., ... & Seidel, J. S. (2000). Effect of out-of-hospital pediatric endotracheal intubation on survival and neurological outcome: a controlled clinical trial. Jama, 283(6), 783-790. Given that hemorrhage is the leading cause of death in patients suffering from severe traumatic injuries, the utility of prehospital blood product transfusion has been a highly debated topic. Despite the important role of early transfusion in the management of hemorrhagic shock, the majority of published data at this time has shown inconclusive findings with regards to survival benefit from prehospital blood product transfusion, particularly within civilian trauma systems. Many of these studies suffered from significant flaws, and therefore, the verdict is still out on the role of prehospital transfusion. The purpose of this study was to address these deficiencies in the medical literature by studying the effect of prehospital transfusion within the context of the US military experience on MEDEVAC aircraft in Afghanistan. More specifically, the authors of this manuscript wanted to study the following question: Is prehospital blood product transfusion among military combat casualties associated with improved survival at 24 hours and at 30 days? The interventions that were examined were 1) initiation of prehospital transfusion (red blood cells and/or plasma) and 2) minutes from MEDEVAC rescue to initiation of transfusion regardless of setting (i.e. in the field vs surgical hospital). As stated earlier, the key outcomes that were examined were survival at 24 hours and at 30 days. Interestingly, the investigators compared individuals who received prehospital transfusion to nonrecipients of prehospital transfusion. These individuals were frequency matched based on 5 characteristics including mechanism of injury, prehospital shock, type and severity of traumatic limb amputation hemorrhagic torso injury assessed by Abbreviated Injury Scale (AIS) and finally severity of head injury assessed by AIS score. Using Cox regression analysis, further stratification was performed and adjusted for age, injury year, transport team, tourniquet use and time to MEDEVAC rescue. · Within 24 hours of MEDEVAC rescue, 3/55 (5%) of prehospital transfusion recipients died compared to 85/447 (19%) of non-recipients (between group difference -14%; 95% CI -21% to -6%; p=0.01). · Among the 386 patients within the matched groups, adjusted hazard ratios were calculated. The investigators reported the adjusted hazard ratio for mortality to be 0.26 (95% CI 0.08 to 0.84; p=0.02) within the first 24 hours. Within the first 30 days, the adjusted hazard ratio for mortality was 0.39 (95% CI 0.16 to 0.92; p=0.03). · For US military casualties in Afghanistan, prehospital blood transfusion was associated with a statistically significant improvement in survival at 24 hours and 30 days compared with a matched sample that received no prehospital transfusion. · Early prehospital transfusion was associated with improved mortality but only within the first 15 minutes of MEDEVAC rescue. There is no question that civilian trauma care has been greatly influenced by lessons learned on the battlefield. While this study performed on MEDEVAC helicopters in Afghanistan supports the notion that improved mortality can be achieved with prehospital blood transfusion for hemorrhagic shock, the translation of these findings to EMS systems back home may be more challenging. For starters, the logistical implementation of prehospital blood transfusion would require massive utilization of precious resources. Refrigeration, coordination with blood banks and hospitals, and care as to avoid wasting of life saving blood products are few of the many obstacles to ubiquitous implementation of prehospital blood transfusion in the civilian EMS world. Furthermore, the advanced resuscitative capabilities of MEDEVAC aircraft may not always be readily available in civilian systems, which may have accounted for the improved mortality observed in the study. Overall, while the results from the study were extremely encouraging, more research needs to be done to evaluate the precise role of prehospital transfusion in civilian EMS settings. Article Bites #3: Does the Duration and Depth of Out-of-Hospital Hypotension affect mortality in TBI? Outcomes related to traumatic brain injury are thought to be related to cerebral perfusion pressure (among other factors). Cerebral perfusion pressure is equal to mean arterial pressure minus the intracranial pressure. Hypotension decreases cerebral perfusion pressure to the brain and is associated with increased mortality in this patient population. This is of particular importance especially in the prehospital arena where prior research has demonstrated that hypotension is associated with increased mortality in patients with traumatic brain injury. However, there have been no studies to date have examined the relationship between both the depth and the duration of hypotension with mortality in patients with traumatic brain injury. The investigators of this study sought to tackle this very issue. The investigators conducted a retrospective observational study of patients with traumatic brain injury within the EPIC (Excellence in Prehospital Injury Care) database as part of the Arizona State Trauma Registry between January 2007 and March 2014. The primary outcome examined was survival to hospital discharge. Patients were determined to have traumatic brain injury based on trauma center diagnoses as a part of either isolated traumatic brain injury or multi system traumatic injury. More specifically, participants were selected who met the classification for moderate or severe traumatic brain injury based on CDC guidelines, ICD-9 head region severity scores and Abbreviated Injury scores. Patients were excluded from the study if they were younger than 10 years of age, were involved in an interfacility transfer or had any systolic blood pressure greater than 200, or systolic blood pressure of 0 indicating traumatic arrest. Hypotension was defined as SBP <90 mmHg. To calculate the “dose” of hypotension, the investigators looked at the depth of hypotension integrated across exposure time (in minutes) AKA “area under the curve”. The integrated values from all hypotensive segments were added together to obtain a dose (in mmHg-minutes). The relationship between mortality and hypotension dose was examined by logistic regression analysis with adjustment for confounding factors. Out-of-hospital hypotension for patients with traumatic brain injury is associated with worse patient outcomes, i.e. decreased survival to hospital discharge. While this study was observational and did not address whether treatment of hypotension improved survival or neurologically intact recovery, it did emphasize an important variable that may serve as the foundation for future EMS research and quality improvement initiatives regarding the management of traumatic brain injury in the field. Going forward, more accurate (and more frequent) acquisition of blood pressure measurements in the prehospital setting may prove to be invaluable in implementing future prehospital resuscitative strategies for patients with traumatic brain injury. Adults aged 65 and older make up a significant proportion of the population (estimated to be approximately 20% of the total US population by 2030). In addition, this subset of patients has disproportionate utilization of EDs as well as EMS services (estimated at 38% of EMS transports). Little is known regarding the precise characteristics of this population that is associated with higher utilization of EMS. The investigators of the study aimed to investigate the proportion of older adults receiving repeat transport within 30 days and to potentially identify characteristics that were associated with repeat use of EMS. The investigators conducted a retrospective analysis of EMS transports listed in the North Carolina Prehospital Medical Information Systems (PreMIS) database from 2010 to 2015. In particular, EMS encounters that were associated with 911 calls for adults aged 65 years or older that resulted in transport were examined. The primary outcome that was evaluated was repeated EMS transport within 30 days. Additional secondary outcomes that were examined included stratification of individuals by total number of EMS transports during the study period within 30 days. A multivariable logistic regression model was used to calculate adjusted odds ratios and 95% confidence intervals of repeated EMS transport within 30 days. Greater than 1 in 6 EMS transports of individuals greater than the age of 65 is followed by a repeated transport within 30 days. Repeat transport of elderly adults is associated with significant healthcare costs and utilization of limited resources both in the hospital and pre-hospital setting. Identification of specific variables that are associated with repeated transport may assist with the development of targeted strategies to both improve patient outcomes and simultaneously decrease the demand for EMS resources that are already stretched very thin. Bystander CPR and defibrillation has been associated with increased survival in patients with out-of-hospital cardiac arrest (OHCA). It is well studied that many patients who survive cardiac arrest have long term neurological deficits secondary to anoxic brain injury. Many of these patients require assistance with activities of daily living in the form of nursing home care. However, there is little known whether there is any improvement in functional outcomes for patients with OHCA in the setting of bystander CPR and defibrillation. The authors of this study hypothesized that bystander CPR in addition to use of an automated external defibrillator would potentially augment cerebral perfusion and reduce the extent of neurological insult by decreasing the amount of time to acquisition of ROSC. The authors sought to examine whether bystander CPR and bystander defibrillation would affect long term risk of anoxic brain damage or nursing home admission among 30 day survivors of OHCA over a 1 year period. Danish investigators evaluated all 30 day survivors for OHCA aged 18 and older who were listed in the Danish Cardiac Arrest Registry from 2001 to 2012. Using nationwide registries, 1 year risk of anoxic brain injury, nursing home admission and all cause mortality was examined. Survivors of cardiac arrest were divided into four groups: 1) no bystander resuscitation 2) bystander CPR but no bystander defibrillation 3) bystander debrillation (regardless of bystander CPR status) and 4) EMS witnessed cardiac arrest. In addition, temporal changes in bystander interventions were studied (i.e. outcomes in relationship to increasing rates of bystander interventions in Denmark over the study period). 10.5% of patients had anoxic brain injury or were admitted to a nursing home. 9.7% of patients died within 1 year. Percentage of bystander CPR in OHCA unwitnessed by EMS (n=2084) increased from 66.7% to 80.6% (p<0.001) over the course of the study. Percentage of bystander defibrillation increased from 2.1% to 16.8% (p<0.001). In concert, the rate of brain damage or nursing home admission decreased from 10.0% to 7.6% (p<0.001). All cause mortality decreased from 18.0% to 7.9% (p=0.002). There is lower risk of anoxic brain damage, nursing home admission or death from any cause in 30 day survivors of OHCA who undergo bystander CPR or bystander defibrillation compared to those who do not receive bystander intervention. Denmark has instituted widespread initiatives including mandatory and voluntary CPR training, dissemination of automated external defibrillators throughout the country, health care professionals at emergency dispatch centers and dispatcher-assisted CPR. System wide measures and efforts to educate the lay public on BLS skills including high quality CPR and use of automated external defibrillation, is a critical step in both increasing survival rates from OHCA and improving functional outcomes for patients.